Do you have a pub or bar that is a star stockist? We need great case studies to demonstrate how to upsell and boost profits with low and no alcohol options. Want to sponsor the venue or public facing aspects of this guide? We have opportunities for you to be involved at the very beginning of this groundbreaking project. 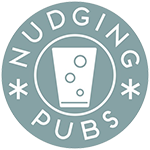 If you would like to make a donation then use the button below – please state that you want this to be a donation for Nudging Pubs and let us know my emailing carmen@joinclubsoda.co.uk.